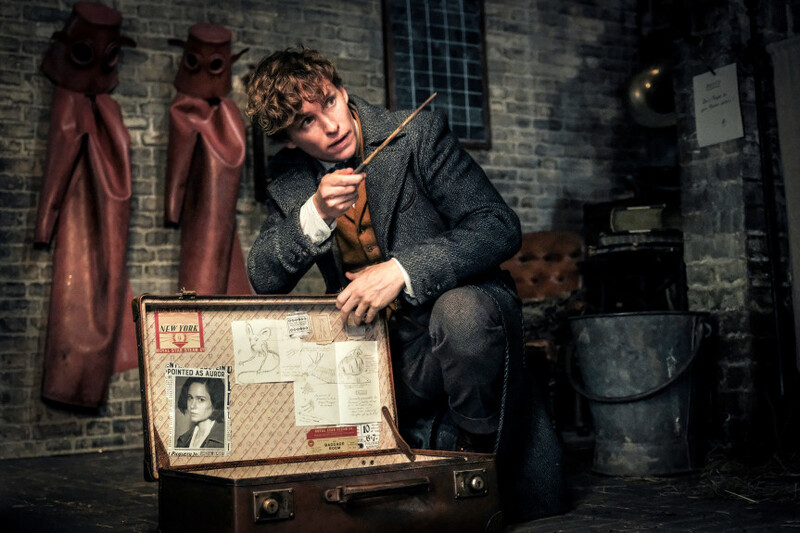 Los Gatos Rotary hosted a Nov. 16 screening of ‘”Fantastic Beasts: The Crimes of Grindelwald’ to support families staying at the Ronald McDonald House at Stanford Hospital. For families of children receiving critical medical care, a trip to the movies can be a magical respite. 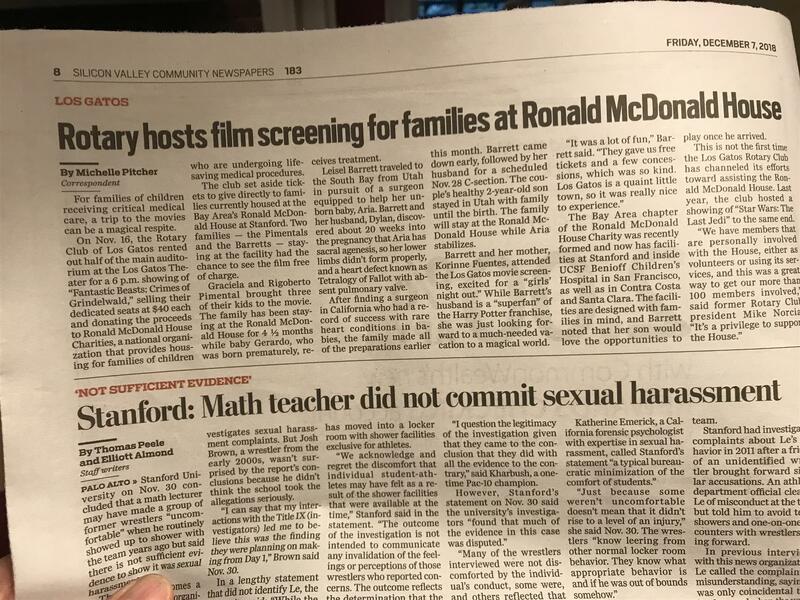 On Nov. 16, the Rotary Club of Los Gatos rented out half of the main auditorium at the Los Gatos Theater for a 6 p.m. showing of “Fantastic Beasts: Crimes of Grindelwald,” selling their dedicated seats at $40 each and donating the proceeds to Ronald McDonald House Charities, a national organization that provides housing for families of children who are undergoing life- saving medical procedures. The club set aside tickets to give directly to families currently housed at the Bay Area’s Ronald McDonald House at Stanford. Two families—the Pimental’s and the Barretts—staying at the facility had the chance to see the film free of charge. Graciela and Rigoberto Pimental brought three of their kids to the movie. The family has been staying at the Ronald McDonald House for 4 1/2 months while baby Gerardo, who was born prematurely, receives treatment. Leisel Barrett traveled to the South Bay from Utah in pursuit of a surgeon equipped to help her unborn baby, Aria. Barrett and her husband, Dylan, discovered about 20 weeks into the pregnancy that Aria has sacral agenesis, so her lower limbs didn’t form properly, and a heart defect known as Tetralogy of Fallot with absent pulmonary valve. After finding a surgeon in California who had a record of success with rare heart conditions in babies, the family made all of the preparations earlier this month. Barrett came down early, followed by her husband for a scheduled Nov. 28 C-section. The couple’s healthy 2-year-old son stayed in Utah with family until the birth. The family will stay at the Ronald McDonald House while Aria stabilizes. Barrett and her mother, Korinne Fuentes, attended the Los Gatos movie screening, excited for a “girls’ night out.” While Barrett’s husband is a “superfan” of the Harry Potter franchise, she was just looking forward to a much-needed vacation to a magical world. The Bay Area chapter of the Ronald McDonald House Charity was recently formed and now has facilities at Stanford and inside UCSF Benioff Children’s Hospital in San Francisco, as well as in Contra Costa and Santa Clara. The facilities are designed with families in mind, and Barrett noted that her son would love the opportunities to play once he arrived. This is not the first time the Los Gatos Rotary Club has channeled its efforts toward assisting the Ronald McDonald House. Last year, the club hosted a showing of “Star Wars: The Last Jedi” to the same end.